WoodStraw® was developed by Forest Concepts to address soil risk during and after grading operations, road-building, wildfires, and other land-altering events. A range of materials are commercially available to reduce the erosive effects of wind and/or rainfall, including agricultural straw, hydraulic mulches, and rolled erosion blankets. 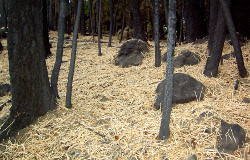 Each of the conventional materials have limitations sufficient enough that federal agencies supported Forest Concepts, beginning in 2002, to develop a new erosion control material that would be long-lasting, wind resistant, naturally weed-free, and could be transported and applied using conventional hay and straw methods. Three years of research and development resulted in a wood-strand material that is optimized for technical performance and ease of application. More than 15,000 tons of the wood-strand material has been used on a range of road, post-wildfire, watershed protection, streambank and other uses across federal, state, and private lands in the western United States. Forest Concepts' FlowCheck™ hillslope erosion control structure was developed to make it easier to accomplish erosion control on burned-over lands, graded slopes and other disturbed areas. The scientific basis for sediment storage behind wood hillslope structures was developed by the U.S. Forest Service Rocky Mountain Research Station. Forest Concepts, LLC combined the best available science with disciplined design according to the Appreciative Design methodology. The resulting structures are technically sound, while providing an important use for underutilized small diameter timber. Utilization of smallwood from forest thinning, fuel reduction programs and forest management provides revenues to landowners and new jobs in rural areas. Copeland, N.S., B.S. Sharratt, R.B. Foltz, J.Q. Wu, J.H. Dooley (2006). Evaluating material properties to optimize wood strands for wind erosion control. ASABE Paper No. 062199. American Society of Agricultural and Biological Engineers. St. Joseph, MI. 9. Wind erosion is a widespread problem in much of the western United States due to arid conditions and persistent winds. Fugitive dust from eroding land poses a risk to both environmental quality and human health. Since the advent of the Clean Air Act in 1971, ambient air quality standards have been set regulating particulate matter in the atmosphere. Agricultural straw has been widely used for erosion control, but there are numerous drawbacks to its use. 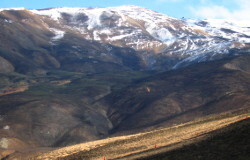 In addition to the fact that it is a lightweight material and lacks stability during high wind events, there is growing concern over the introduction of noxious weeds to wildlands, chemical residues from pesticides, and risks associated with dust particles liberated from the shattering of straw elements during the application process. The efficacy of a wood strand material, a wood analog to straw, for wind erosion mitigation was investigated during this study. A series of wind tunnel tests were conducted to evaluate material properties of wood strands in terms of reducing total sediment loss and maintaining air quality. Results indicate that wood strands are stable at wind speeds of up to 18 m/s, while wheat straw is only stable at wind speeds of up to 6.5 m/s. At a wind velocity of 18 m/s, the straw, due to its instability, did not reduce soil loss; however, wood strands reduced total sediment loss and peak dust emissions by over 90% when compared to a bare soil. Dooley, J.H. 2013. Field experience with wood-strand erosion control mulch on mine and pipeline projects. Paper presented at the 2013 National Meeting of the American Society of Mining and Reclamation, Laramie, WY Reclamation Across Industries June 1 - 6, 2013. R.I. Barnhisel (Ed.) Published by ASMR, 3134 Montavesta Rd., Lexington, KY 40502. Soil erosion is a significant risk during and after grading operations on mine and pipeline sites. A range of materials are commercially available to reduce the erosive effects of wind and/or rainfall, including agricultural straw, hydraulic mulches, and rolled erosion blankets. Each of the conventional materials have limitations sufficient enough that federal agencies supported development of a new material beginning in 2002 that would be long-lasting, wind resistant, naturally weed-free, and could be transported and applied using conventional hay and straw methods. Three years of research and development resulted in a wood-strand material that is optimized for technical performance and ease of application. More than 15,000 tonnes of the wood-strand material has been used on a range of road, post-wildfire, watershed protection, streambank and other uses across federal, state, and private lands in the western United States. Among the federally sponsored projects have been many abandoned mine lands (AML) sites. When permitting or contracting new mine and pipeline projects, Federal land agencies including the Bureau of Land Management and the USDA Forest Service have recommended or specified the new material or specified that erosion control materials used must meet its technical performance. Since its commercial introduction in 2005, wood-strand erosion control mulch has been used on at least fifteen mine and pipeline projects in eight western states. This paper reviews the science and design process that led to the technical features of the wood-strand mulch. The paper reports results of a recent survey of land managers, project leaders, and erosion control contractors to assess performance versus design criteria for the material. Results of the survey indicate that engineered wood-strand mulches offer viable wind and water erosion control while providing additional benefits of being weed-free, long-lasting, and wind-resistant. Results of the survey are being used to improve the material and update guidelines for its specification and use for erosion control on mines, pipelines, and other severely disturbed areas. Copeland, N.S., B.S. Sharratt, J.Q. Wu, R.B. Foltz, and J.H. Dooley. 2009. A wood-strand material for wind erosion control: effects on total sediment loss, PM10 vertical flux, and PM10 loss. Journal of Environmental Quality 38:139-148. Fugitive dust from eroding land poses risks to environmental quality and human health, and thus, is regulated nationally based on ambient air quality standards for particulate matter with mean aerodynamic diameter <= 10 µm (PM10) established in the Clean Air Act. Agricultural straw has been widely used for rainfall-induced erosion control; however, its performance for wind erosion mitigation has been less studied, in part because straw is mobile at moderate wind velocities. A woodbased long-strand material has been developed for rainfallinduced erosion control and has shown operational promise for control of wind-induced erosion and dust emissions from disturbed sites. The purpose of this study was to evaluate the efficacy of both agricultural straw and wood-strand materials in controlling wind erosion and fugitive dust emissions under laboratory conditions. Wind tunnel tests were conducted to compare wood strands of several geometries to agricultural wheat straw and bare soil in terms of total sediment loss, PM10 vertical flux, and PM10 loss. Results indicate that the types of wood strands tested are stable at wind speeds of up to 18 m s^-1, while wheat straw is only stable at speeds of up to 6.5 m s^-1. Wood strands reduced total sediment loss and PM10 emissions by 90% as compared to bare soil across the range of wind speeds tested. Wheat straw did not reduce total sediment loss for the range of speeds tested, but did reduce PM10 emissions by 75% compared to a bare soil at wind speeds of up to 11 m s^-1. Foltz, R.B. and J.H. Dooley. 2003. Comparison of erosion reduction between wood strands and agricultural straw. Transactions of the ASAE 26(5):1389-1396. St. Joseph, MI: American Society of Agricultural Engineers. Agricultural straw is widely used as an erosion mitigation measure on disturbed soils. It has several drawbacks, however, which include increasing intrinsic value, increasing transportation costs, weed source, pesticide residues, and dust. An alternative is wood strands manufactured from small diameter timber or low-value veneer. A study to determine the efficacy of wood strands as an alternative to straw showed that straw and two types of wood strands were equally effective in reducing erosion by over 98%. The authors believe that there are opportunities to exceed the erosion control performance of agricultural straw through the disciplined design of a wood analog. Work is continuing to improve the wood strand properties for further field testing. Yanosek, K.B., R.B. Foltz, and J.H. Dooley. 2006. Performance and assessment of wood strand erosion control materials among varying slopes, soil textures, and cover amounts. Journal of Soil and Water Conservation 61(2):45-51. Two blends of manufactured wood strands with different lengths were tested for effectiveness in controlling erosion. Wood strand blends were tested on two soils, two slopes, and at three coverage amounts. Laboratory rainfall simulations were conducted to evaluate runoff and sediment loss. Wood strands were effective in delaying runoff, reducing runoff volume, and reducing sediment loss. There was no statistically significant difference between the two wood strand blends with respect to runoff or sediment loss. In comparison to bare soil with no cover, sediment loss was reduced by at least 70 percent for all cover amounts tested and among each soil type, slope and flow event. In comparison to estimates of sediment loss reductions due to agricultural straw (Burroughs and King, 1989), wood strand materials were equally effective on coarse grained soils and superior to straw on fine grained soils. In contrast to agricultural straw, manufactured wood strands are inherently weed and pesticide free. Consequently, wood-based materials may be a more appropriate material for erosion mitigation, especially in areas where introduction of non-native species is of great concern. Dooley, J.H. 2002. Design and Application of Manufactured All-wood Hillslope Erosion Control Structures. ASAE Paper 025014. St. Joseph, MI: American Society of Agricultural Engineers. The FlowCheck™ hillslope erosion control structure was developed to make it easier to accomplish erosion control on burned-over lands, graded slopes and other disturbed areas. 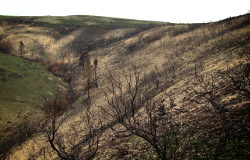 The scientific basis for sediment storage behind wood hillslope structures was developed by the U.S. Forest Service Rocky Mountain Research Station. Forest Concepts, LLC combined the best available science with disciplined design according to the Appreciative Design methodology. The resulting structures are technically sound, while providing an important use for underutilized small diameter timber. Utilization of smallwood from forest thinning, fuel reduction programs and forest management provides revenues to landowners and new jobs in rural areas. More than 600 of the new structures were deployed in forest and wildlands during the fall of 2001. The paper details the design process and first year performance across a range of applications. A method for estimating sediment storage and specifying the spacing for hillslope erosion control materials is provided.